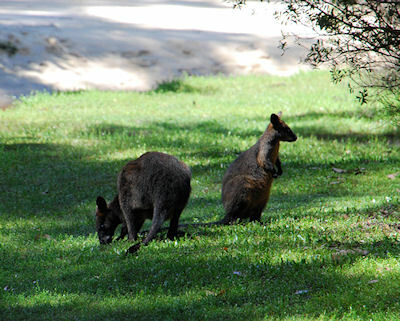 This wallaby is conciderably larger and darker than Bennets Wallaby, therefore sometimes called the Black Wallaby. Scientificly named Wallabia bicolor, it is the only surviving member of the "true" Wallabies. But in fact, it cross-breeds with the Agile Wallaby, that in fact is a kangaroo (Macropus), so it might be correct to call it a kangaroo, too. But well, it is humans trying to sort living beings into categories and making rules about them - nature doesn't even smile about that attempt. 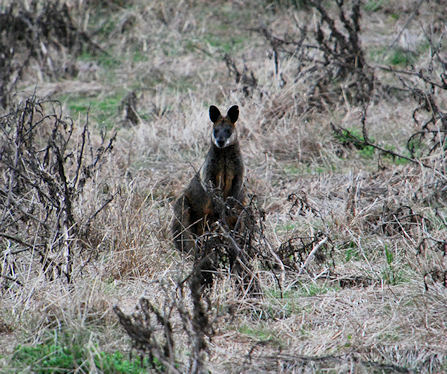 Anyway, the Swamp Wallaby can be found from Northern Queensland to western Victoria, where I photographed them. 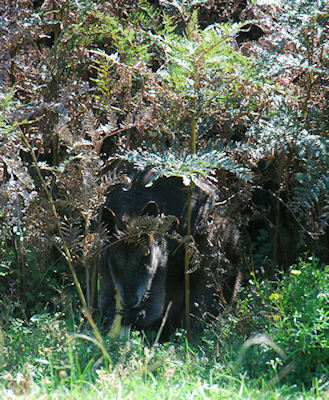 It is not as visible as the Kangaroos, as it lives solitary in different habitats including woodland. 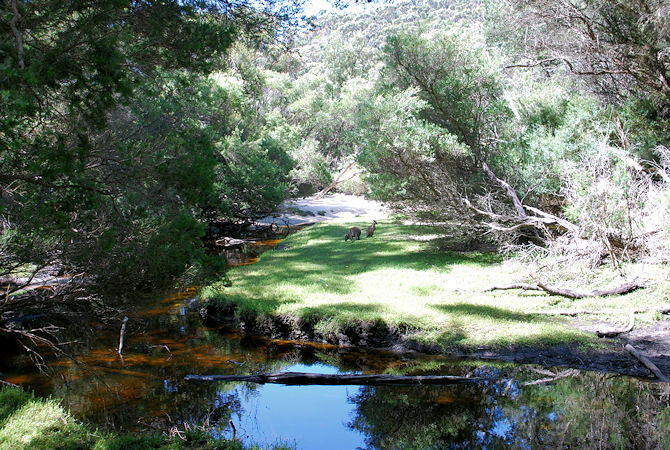 Sometimes, they would be bouncing along the human foot paths, in the more dense vegetation of Wilsons Prom I nearly stepped onto the tail of a specimen hidden in the shrubs only jumping off the very last moment. The fur ball one nearly cannot figure out on the right hand side, is a Swamp Wallaby munching a banana peel. There is something in these peels wallabies just love - and the Australians seem to know. So they throw the peels into places where they won't remain for long.